The logo is quite interesting. First, it seems to be a photostat copied from an earlier story, as you can see from the line at the top indicating what would have been a panel border, though there isn’t one on this page. So, by this time DC was reusing this design on each story, though I don’t know for how long. 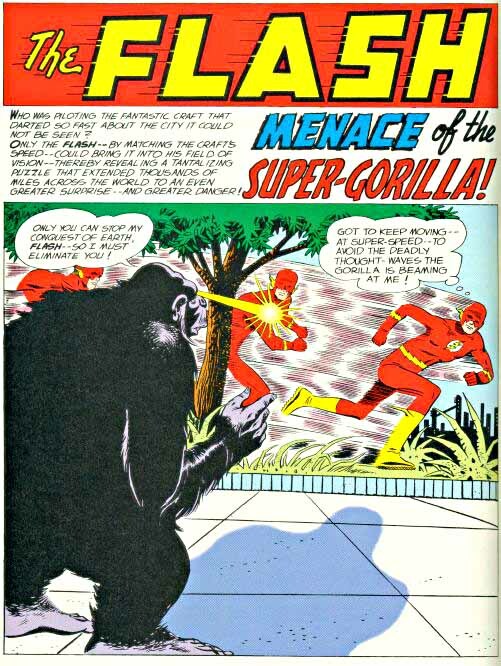 Second, the letter forms are closer to what would become the Silver Age Flash logo than to what was on the cover of this issue, as are the speed lines. Those lines break through the black dropshadow, too, also like the Silver Age logo. Could this have been designed by the same person, Ira Schnapp? I’m tempted to say yes, but one thing gives me pause: the words FASTEST MAN ALIVE are clearly NOT by Schnapp. Were they added by whoever lettered this story? Impossible to tell from the evidence I have. 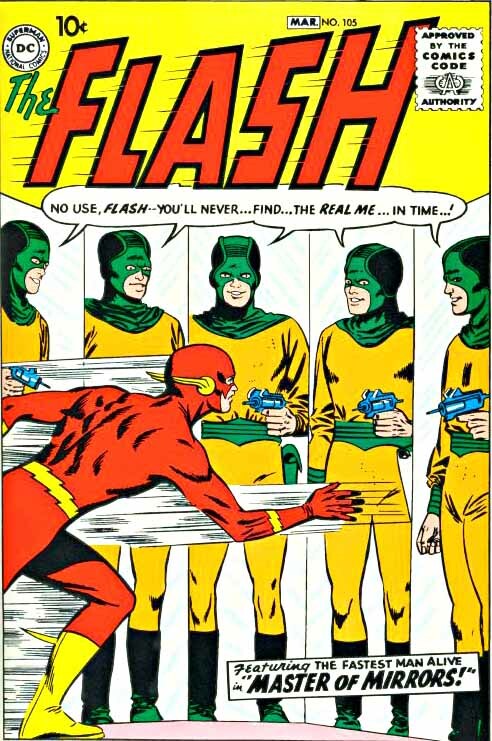 While Carmine would remain almost the sole Flash artist for many years of this revamp, most of the stories would be written by John Broome. But the guiding force behind the revamp was editor Julius Schwartz, who brought his science fiction background into play, pushing for more believable science-based stories and characters. All the lettering and both logos on the cover are by DC’s veteran staff designer Ira Schnapp, now ensconced as the main man for DC logos and cover lettering, and in his prime period. As I’ve written in other logo studies, Schnapp brought his knowledge of classic type design and showcard lettering to his work, and this Flash logo shows his clean, balanced approach. Note that the F is proportional to the rest here, the THE is in the same style but smaller, and the speed lines are only trailing off the left side of the letters, but we’re getting closer to the final Silver Age logo. 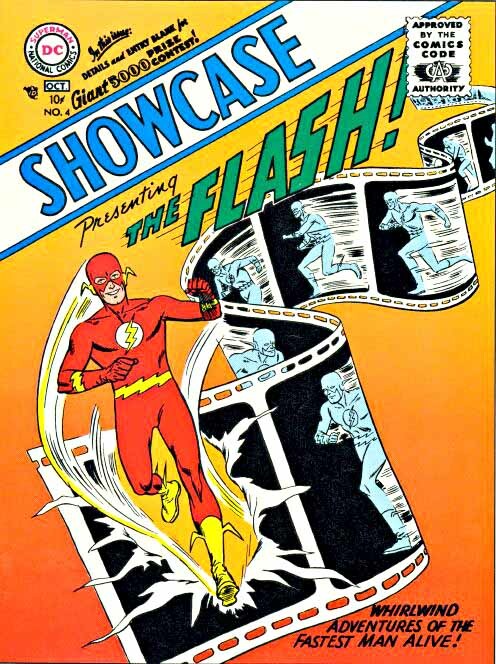 The Flash appeared in four issues of SHOWCASE, and on all the stories inside this thinner, solid black version of his logo appeared. I’d say it’s also by Ira Schnapp, though it could be by the letterer of the stories, Gaspar Saladino, following Schnapp’s lead. Here the F is once more larger, though aligned with the top of the other letters, and THE is now above, but still in the same style. The speed lines look about the same as on the cover. 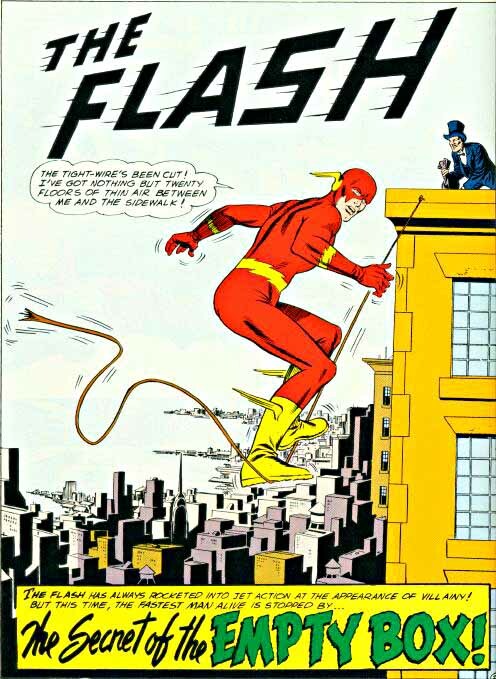 DC took their time assessing sales, but in the end the revamp was deemed a success, and in 1959 THE FLASH began a new regular run, resuming the numbering from the Golden Age series (something almost never done today). 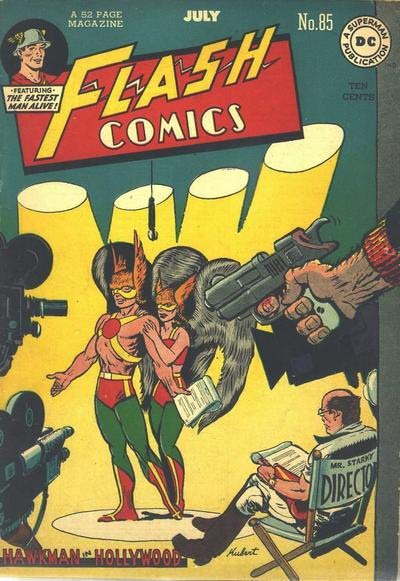 And at last we see the familiar Silver Age logo in its final form, as designed by Ira Schnapp. There’s nothing terribly surprising about the design, we can follow all the ideas in it from past logos, but what really makes it shine is the execution. The letters are much taller than ever before, and beautifully proportioned, with the F just large enough to contrast the perspective of LASH and balance the slightly larger H. The outline is bold enough to stand out against any background art, and the speed lines, while sparse and short, gain emphasis by cleverly breaking through the black outlines. THE is now an attractive open script in familiar Schnapp style. Even having a corner covered by the Comics Code seal doesn’t much interfere with the impact of this fine logo. I know when I first saw it as a child, I was instantly drawn to the book, and I loved the art too. 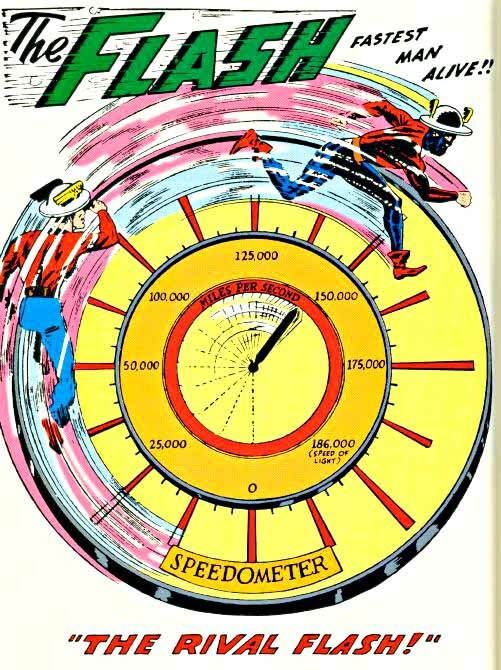 This logo would stay on THE FLASH for many years, and is the one most associated with the character even today for many long-time readers. Issue 105 used the same interior logo as the SHOWCASE issues, but beginning with 106, this new version took over the top of each title page, an equally attractive version probably also by Schnapp, with thicker letters to fill the rectangular space, but otherwise much the same. It, too, would appear on all the Flash stories for many years to come. Everything was set for a long, popular and successful new life for the old DC character. Next time we’ll cover the 1960s to the 1980s. This entry was posted in Logo Studies on April 18, 2008 by Todd.